At the heart of the market is Peter Ward’s internationally renowned Country Choice, a food emporium and purveyor of speciality foods, sold in season, and sourced from only the finest local and international providers. Peter and his wife Mary have been pioneers of fine food in Ireland ever since they established their independent delicatessen, café and supply business in a 200 year old premises on Kenyon Street in Nenagh in 1982. From there, they branched out to become anchor tenants at the Milk Market, selling foods either produced by themselves, or supplied from a select group of Irish and European artisan suppliers. Every weekend, visitors to the Milk Market will happily queue to sample some of Peter’s hot food offerings – with everyone from Munster rugby players to pensioners gathering to taste Peter’s breakfast baps. Cooked to order, the food has been lovingly prepared either on site or in Peter’s Nenagh delicatessen, where the work day begins at 5am, Monday to Saturday. In the early Eighties, Peter’s commitment to slow food, and locally sourced in season produce was met with cynicism by others in the industry, who bluntly told him his business would never survive. The cynics didn’t believe that Irish customers would pay a little bit more for the extra quality that was guaranteed. Thirty six years later, the proof is quite literally in the pudding, black or white. It’s also in Peter’s famous ham, a luxury taste that you simply can’t get in supermarkets. The clue is in the name: the choice of produce on offer is staggering from organic honey, raw milk and cheeses of all varieties, to pesto, fruit, homemade breads, and organic vegetables. The jams, preserves and dressing have all be made lovingly by Mary Ward herself. The Wards are renowned in the food industry for promoting the work of Irish artisan producers, the majority of whom are involved in the international Slow Food movement. Like County Choice they espouse the principles of ‘good, clean, fair’ food. Country Choice also sells a unique range of boutique wines and champagnes, all imported from small organic farms in Spain, France and Italy. These wines are all personally sourced by Peter and Mary whose idea of a break from work is to take food and wine holidays on the continent, especially in their beloved Italy. Their taste is impeccable and the prices are very reasonable, with Peter having forged a personal relationship with each of his wine and champagne suppliers. 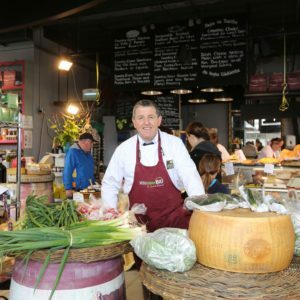 As a past Chairman of the Irish Taste Council, an industry body funded by the government for the promotion of Irish artisan food, it will come as no surprise that Peter’s taste in olive oils and tomatoes, ensures his selection is renowned not just in Limerick, but all around the country. Peter, who has been a shopkeeper since he was 23, is also on the steering committee of Good Food Ireland, a marketing group to promote the use of Irish artisan food in the hospitality industry. Food is in the family, so it’s gratifying to Peter, Mary and all the customers of Country Choice in the Milk Market that his daughters Eliza and Evie have both branched out from the family business, with two businesses of their own. The first is Country Choice on Tour, a festival food business selling iconic hot food, and the second is Nutshed, which started in the Milk Market. A new concept food company, it supplies vegan and plant-based foods to food services and cafes all over Ireland. If you’re going to the Milk Market, you have no choice, you simply have to experience the Ward’s Country Choice.